Rene Martinez is a star guitar tech in the League-of-extraordinary-gentlemen-who-crouch-behind-amplifiers-waiting-for-the-next-onstage-guitar-emergency. And no wonder. After a long tenure with Stevie Ray Vaughan, his credentials as guitar tech run the gamut from Mick Jones, Prince, Carlos Santana, Jimmie Vaughan and, most recently, John Mayer. So when Rene Martinez tries to sell me a product, I'll listen. Heck, I'll even buy it. 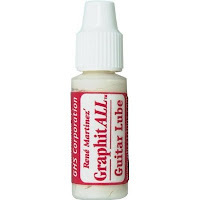 Rene Martinez' GraphitALL is a graphite-based guitar nut lube that prevents the strings from hanging up at that critical area and going out of tune. I also use a little of it at the string-to-bridge-saddle contact point on all my guitars, and occasionally, around the six trem screws on my Fender Strat for a little extra insurance. Another good thing about GraphitALL is that it is white. So if you've been running black 2B pencils over nut slots for the graphite, GraphitALL leaves no black stains on otherwise white bone nuts. Good stuff. Check out Rene Martinez' blog at: http://www.texasguitarwhiz.com/ where he also gives a video demonstration of how best to apply GraphitALL.